Shiny Gold Snap Frames, 25mm, with clip open snap frame profiles for rapid poster changing while your frame remains fixed to the wall. Our Brass Effect Snap Frames are manufactured in powder coated aluminium, with a 1.5mm rear fluted plastic panel and a sheet of UV grade anti-glare PVC protects your graphic. Our snap frame clips open from the front allowing the easy and convenient change of your poster without removing the frame from the wall. Fixtures and instructions are included. This is a premium quality frame at low prices. Order online for next day delivery. Custom Sizes are available. 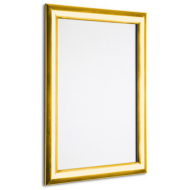 20"x30" Polished Gold Snap Frame, 25mm. For a poster that is 508 x 762mm Our 20"x30" Polished..
30"x40" Polished Gold Snap Frame, 25mm. For a poster that is 30 x40 inches (762mm x 1,016mm). Ou..
A0 Polished Gold Snap Frame, 25mm. A0 Polished Gold Snap Frame, 25mm. For a poster that is 841mm x 1,189mm. Our A0 Polished Gold..
A1 Polished Gold Snap Frame, 25mm.For a poster that is 594mm x 841mm. Our A1 Polished Gold 25mm ..
A2 Polished Gold Snap Frame, 25mm. For a poster that is 594mm x 420mm. Our A2 Polished Gold 2..
A3 Polished Gold Snap Frame, 25mm. For a poster that is 420mm x 297mm. Our A3 Polished Gold 2..
A4 Polished Gold Snap Frame, 25mm. For a poster that is 210mm x 297mm. Our A4 Polished Gold 2..
A5 Polished Gold Snap Frame, 25mm. For a poster that is 148mm x 210mm. Our A5 Polished Gold 2..